Bar/Bat Mitzvah Events by Outdoor Laser Tag, USA - Leading provider of Mobile Laser Tag for Birthday Parties, Camps and Corporate Events! Looking for something different to celebrate this special occasion? If you want to add a fun, unique activity that everyone can enjoy, then look no further than Outdoor Laser Tag. We create a special party that is just as special as this special day -- a party that your child, their friends and all your guests (adults too!) will enjoy, remember and talk about for some time. Outdoor Laser Tag is not only fun but it also teaches players about team work and planning, and because anyone can play it with any skill level, all of your guests will jump-in to have fun. No fear of guests not participating, and we make every player leave the game feeling like a winner and part of this special day. We are 100% mobile and can come to your home, temple or site of your party and set-up a mission field or fields starting in size from 1/2 a basketball court up to an entire football field to allow up to 150 participants to play several games each hour (indoors or outside). 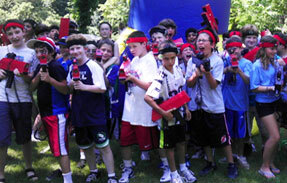 You can also book your party and come to our state-of-the-art Outdoor Laser Tag Mission Field at our camp at Black Bear Lake Day Camp in Clarksburg, NJ (60 minutes from NYC) where we offer a complete menu of activities, pools, sports and can fully cater an event for up to 3,000 people. We are event planners and will take the stress away from your event booking. This is a turn-key activity that only requires you to get space and bring the players. We will manage the set-up and take down of all equipment, provide music during the event, and, with our trained staff, we will manage all of the missions and engage your guests while they play Outdoor Laser Tag with us. 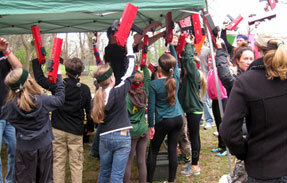 Outdoor Laser Tag is high-impact and challenging, yet safe and inclusive for all of your guests. All skills levels can play and will want to play since there is no pain from messy projectiles or mess. *We have 125 lasers that can be booked for your event. Email Andrew or call for a quote on booking more than 50 lasers. We can also set up 2 or 3 fields to accommodate large groups. Our fields contain a number of great obstacles from Mighty Paintball including inflatable barrels, tanks and barriers of different sizes and shapes, camouflage forts and pop-up tents, creating a unique, customizable mission field of play starting at $100 up to $275.